Commercial washers, dryers, roller ironers coin operated or not. Create your own business with low capital investment and instant performance. Open your own laundry now without franchise fees & royalties, without staff, without any special knowledge, with low operating costs! Active Commercial Systems start operating in 2005. Our company following the desire of evolution and innovation into the Greek market becomes representative of the American company Maytag Commercial. Maytag Commercial is the company that manufactured the first washing machine in 1907 and up today 100 years later is still a pioneer. In 2011 our company undertake the development of a specific model of stores – franchise with American equipment of Commercial washers and Commercial dryers easywash Self Service Laundry. Through this movement Active Commercial Systems created a certain model shop, the so called easywash Self Service Laundry. 10 years warranty, in American Commercial washers and in American Commercial dryers of Maytag Commercial, Dexter Laundry and ADC depends on each model and it is the result of the pioneer and leading American factory designs. 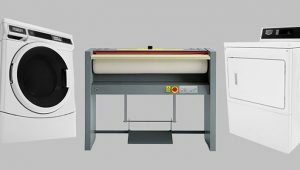 Commercial washers are able to clean bigger amounts of every type of fabric in less time, but combined with the Energy Advantage technology they have, they are more efficient and able to minimize even more the operating costs. Active Commercial Systems covers the cleaning needs of fabric enterprises, regardless of their size such as hotels, rooms to let, camping, gyms, hair salons, hospitals, units of the armed forces and Security bodies (camps), dormitories etc. Our company can also supply you also with professional ironing roller. ACTIVE COMMERCIAL SYSTEMS is the only company that has created a certain model of easywash Self Service Laundry stores (coin washers and coin dryers) in Greece and in the Balkans with automatic commercial washers and dryers for the public. American commercial washers & American dryer’s coin operated for the public is an investment that works without staff. Self – service is the key of success. 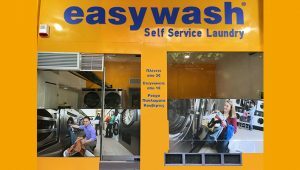 easywash Self service Laundry is a company that operates from early morning until late evening, 365 days per year. An investment without fees and royalties for the public. An INVESTMENT in an easywash Self Service Laundry is the SMART SOLUTION! 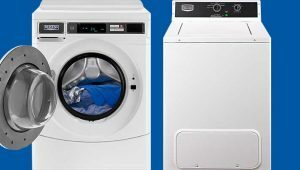 In Active Commercial Systems due to experience and reliable Commercial Washers and Commercial Dryers of Maytag Commercial, Dexter Laundry and ADC, we help you to plan a new laundry room or renovate an existing one. easywash Self Service Laundry (commercial washers and commercial dryers with coins for the public) is a store that operates 07:00 - 24:00 without any staff. It is an investment with low cost and high return on investment, without franchise fees & royalties. All franchise stores are based entirely on the American commercial washers and dryers of Maytag Commercial.